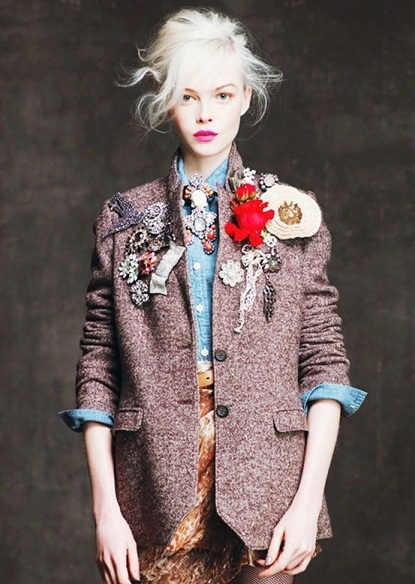 I literally gasped when I spotted this sweet idea of pairing your favourite vintage brooch with an everyday hairdo. Whether it’s a messy bun, a loose braid or a slick updo, it seems to add such a charming edge to even the simplest of looks. I totally want to try it out with a top-knot, old jeans, and a slouchy blouse. J'adore! I did this once, and it was so easy and worked so well...great idea - would totally do it, again. Such a wonderful idea! Def going to ask my stepdaughters if they want to wear my vintage brooches in their hair, they would look adorable! Ok, I don't have one of these, but I do love this idea! Fantastic, Smita! I can't wait to try it out. Awww..Di, they totally would:) You're such a sweetheart. holtkamp, I bet you can find some awesome gems on your local flea market. Oh wow, I love that. I think it'd get caught in my hair, thought. Me, too! I want to try it with some of my more drab dresses. I actually dont really wear brooches but I think this fall I may start to incorporate them into my wardrobe more often. oh lala - i like! - i want a vintage brooch bouquet if i decide to do a wedding instead of flowers!!! Oh wow they are so pretty. Very feminine and lovely. Love the twist on a vintage broach! Great Idea, I look forward to trying it out! It's such a beautiful look, isn't it? kishipsa, that is such a great idea - "pinned on the sleevs just like a cuff link"
That is a great idea! I have a few brooches and rarely wear them, so that would be a great way to "display" them. Such a feminine, but laid back look. I love this!